It’s the Tarot Blog Hop & it’s the last one for 2017. Err, where’s the year gone?! It’s Yuletime & it’s the darkest part of the year. From now on, the light starts to return. Though we probably won’t notice it for a few weeks, I know my feathered egglaying pets will! The wrangler for this hop is Ania Marczyk asked this of us: “Wishing on a Star. As we approach the final festival of the calendar year, we prepare for a time of feasting and drinking. 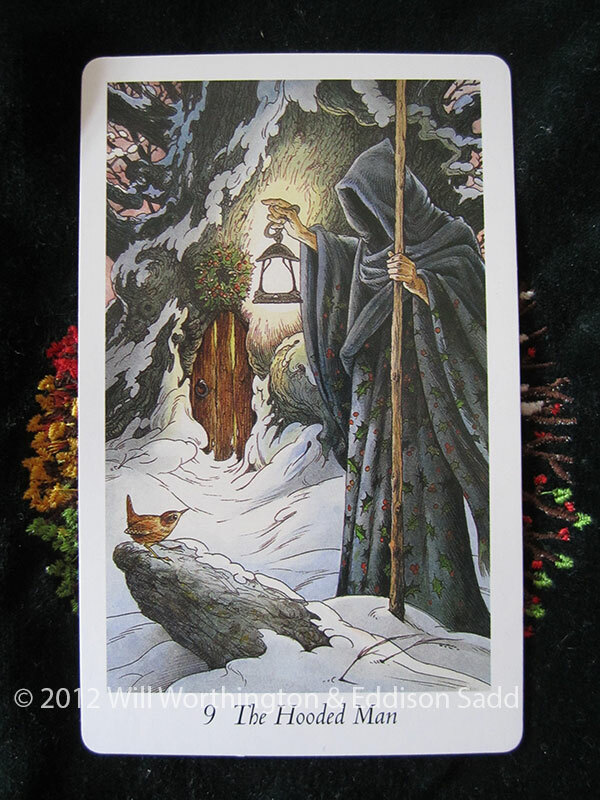 Whether you are observing Yule, the winter solstice, Christmas, any other holiday, or just being able to down tools for a few days, it is a time for celebration and also for anticipation and wishes. With this in mind and before you fling yourself headlong into the spirit of seasonal over-indulgence, take a moment to reflect on what this year has brought you and what you wish for the next year to bring. 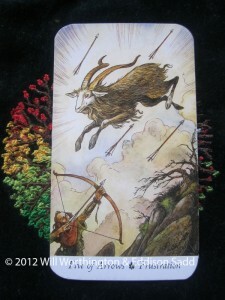 I decided to show you what cards I think suit the approaching festival of the year. Though, by the time this blog post goes live to match the others, the height of Yule will have passed. So, to celebrate here’s what I think the Wildwood has to offer. The 4 of bows is what most of us hope to encounter over the Christmas / Yuletide period. There are moments though when it’s more like the 5 of Swords/Arrows, but hey, that’s family for you! I’m going to be avoiding most of the conflicts this year, we’re staying home with the kids: just us, the cat, the dog, the dozen chickens & the fish that need tending to. So this Yuletide, what is it you WANT to have happen around you? The 4 of Bows or the 5 of Arrows? What is it you are wishing for this Yuletide / Christmas Time? After the presents are opened, it’s going to be more Hermit mode for everyone! I wonder what others have thought up for the blog hop? Let’s go & see what Asali has in her blog hop. Follow the links! 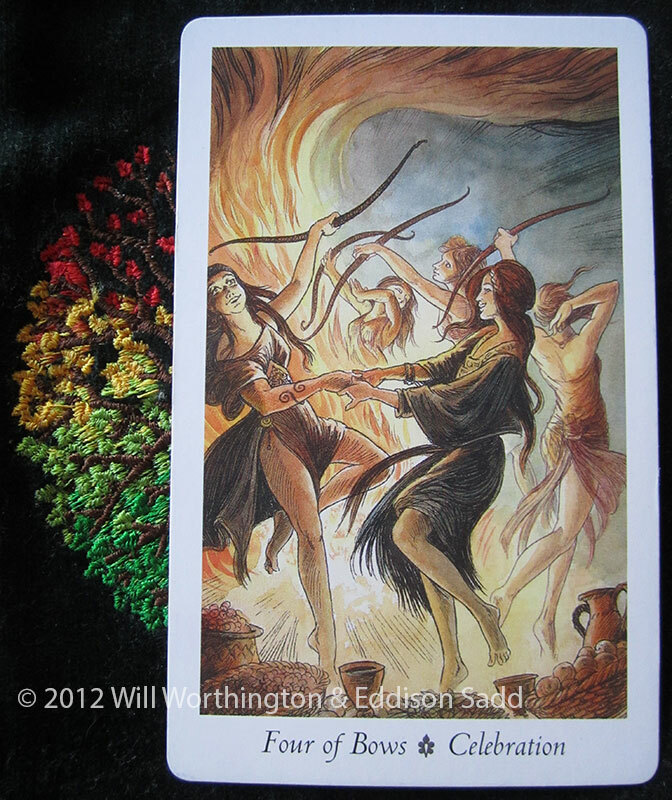 Well, it’s certainly nice to be dancing around the fire inside when it’s all Hermity/wintery outside. Sounds like you’ve got more Christmas-y weather than we have. Here in Colorado we’ve had almost no snow at all, although in celebration of the season, the gods decided this morning to give us enough of a dusting to remind us of what we’re missing. Happy holidays! We had about 10 inches last this time last week! Sledging with the kids (mainly the daughter, because she still thinks going sledging with mum is fun!) & I thoroughly enjoyed myself! The dog though, poor old thing, was quite glad to get indoors again thank you very much! May you & yours have a great Yuletide/Christmas & a brilliant 2018! 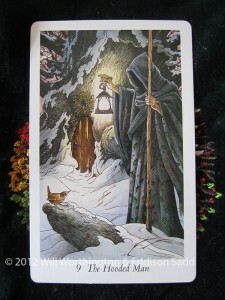 I am doing winter solstice readings with clients today and spending time with my immediate family this evening. I try to take the holidays moment to moment. Our evening will probably involve playing games and going for a family walk to look at holiday lights. But, that’s my wish. 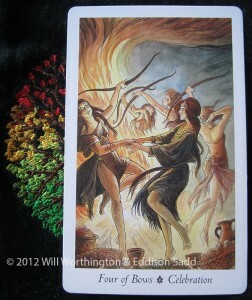 I can easily see how the 5 of Wands can come in as others cast their vote on activities! I hope you & yours have a great Christmas Holiday with those that you love. 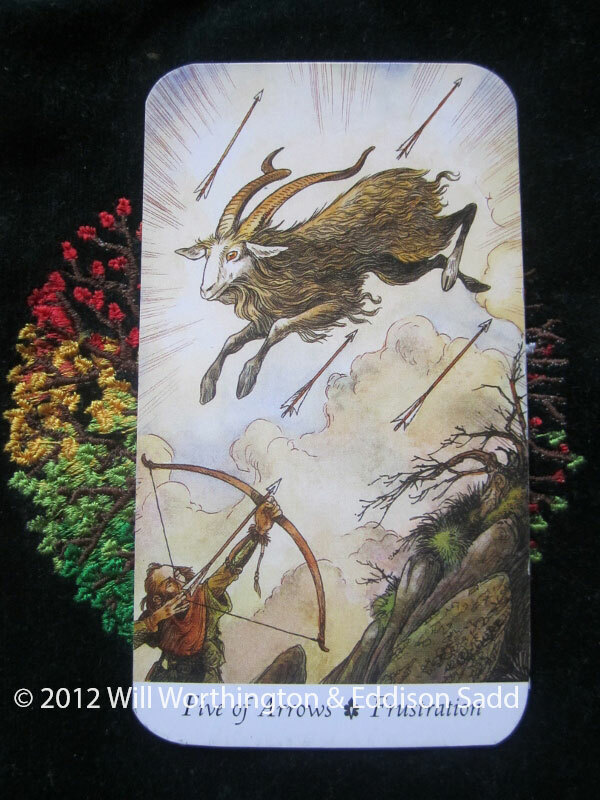 More 4 of Wands than 5 of Arrows! I’m definitely ensuring it’ll be the 4 of Bows and yeah that means staying away from the bulk of bio family stuff and ensuing drama. Chosen family, friends, and community will be my companions and or mish-mash gatherings work just right for us! Hope you have a 4 of Bows kind of celebration! May your intentions be fulfilled this holiday season! Haha! Yes, avoiding the goats & not getting shot by any rouge comments is certainly on the cards! May you avoid that too! Yay! The 4 of Bows is a beautiful card <3 I love staying in so I hope you'll enjoy it too hahaha. 4 of Bows please! Just the other week I was stuck indoors for days…heaviest snow in 10 years (and really not that much) and couldn’t get down the hill or up if I tried in a car due to the ice. First winter! It was sorta fun as I could blame staying indoors and hibernating on the weather! Enjoy!